California Governor Brown has called for the implementation of 12,000 MW of “localized electricity generation”, namely DER, which can help the State reach its goal to acquire 33 percent of its energy from eligible renewable energy resources by 2020. However, high penetrations of these DER systems, located within distribution grids which were designed only for handling customer loads, could adversely affect utility operations. Capacitor Banks- An array of capacitors connected into a circuit. Capacitors are used to control the voltage that is supplied to the customer by eliminating the voltage drop in the system caused by inductive reactive loads. Capacitors are considered to generate reactive power. 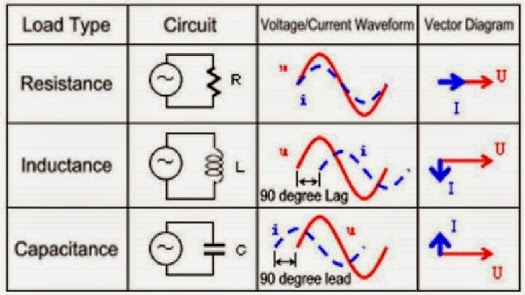 This is the fundamental mechanism for controlling the power factor in electric power transmission; capacitors are inserted in a circuit to partially cancel reactive power of the load. The IEEE adopted DNP3 as IEEE Std 1815-2010 on the Jul 23, 2010. In April of 2012, the IEEE approved Std 1815-2012 for publication. The 2012 version of the standard includes features for Secure Authentication Version 5. IEEE 1547 - Standards governing solar-grid connections in the United States. Under IEEE 1547 guidelines, the general practice for small PV inverters is that they will not attempt to directly regulate the voltage on the distribution system. 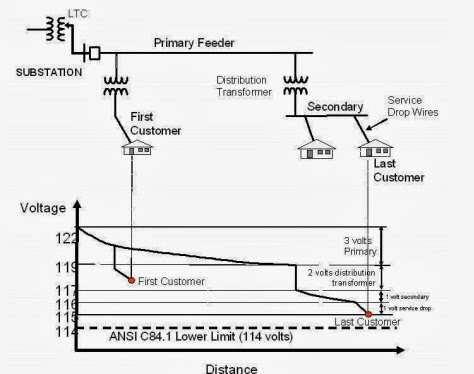 IEEE 1547 requires that PV inverters disconnect any time the grid gets unstable for safety, to make sure solar power doesn't flow through a downed power line and shock a utility worker, for example. But that safety measure also prevents solar inverters from helping out in cases in which the instability isn’t caused by a downed line. Indeed, turning off lots of inverters all at once, can destabilize the grid even more. Inverter - An electrical power converter that changes direct current (DC) to alternating current (AC). Photovoltaic systems generate DC power. Inverters convert this DC power to AC power so these systems can interconnect with the grid. An inverter can produce square wave, modified sine wave, pulsed sine wave, or sine wave depending on circuit design. The two dominant commercialized waveform types of inverters as of 2007 are modified sine wave and sine wave. Modern inverters use software-driven electronics to flip and smooth the output into standard 60 Hz waves. 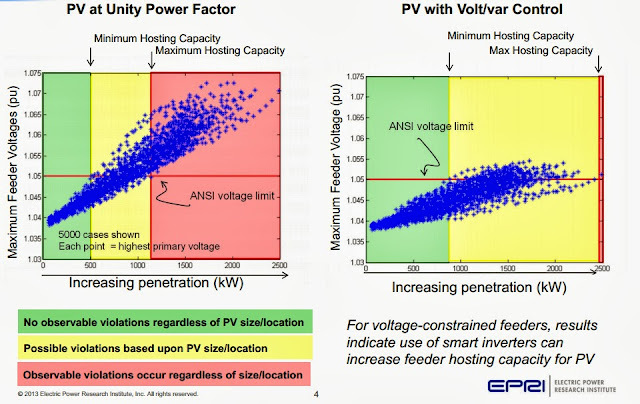 Since inverters are software driven, their output can be modified to benefit the grid. Grid-interactive inverters must produce AC power that matches the voltage, frequency and phase of the power line it connects to. There are numerous technical requirements to the accuracy of this tracking. Islanding - A distributed (DG) generator continues to power a location even though electrical grid power from the electric utility is no longer present. Islanding can be dangerous to utility workers, who may not realize that a circuit is still powered, and it may prevent automatic re-connection of devices. For that reason, distributed generators must detect islanding and immediately stop producing power; this is referred to as anti-islanding. LVRT - Low Voltage Ride Through - A capability of electrical devices, especially wind generators, to be able to operate through periods of lower grid voltage. Similar requirements for critical loads such as computer systems and industrial processes are often handled through the use of an uninterruptible power supply (UPS) to supply make-up power during these events. Many generator designs use electrical current flowing through windings to produce the magnetic field that the motor or generator operates on. Such devices may have a minimum working voltage, below which the device does not work correctly, or does so at greatly reduced efficiency. Some will cut themselves out of the circuit when these conditions apply. In a grid containing many distributed generators subject to low-voltage disconnect, it is possible to create a chain reaction that takes other generators offline as well. This can occur in the event of a voltage dip that causes one of the generators to disconnect from the grid. As voltage dips are often caused by too little generation for the load, removing generation can cause the voltage to drop further. This may bring the voltage low enough to cause another generator to trip out, lower it further, and causing a cascading failure. Microinverter - an inverter integrated to each solar panel module. The output of each module can be paralleled to combine the capacity and interconnected to the grid. While more expensive than central inverters that use multiple modules connected in series, this arrangement provides easier installation, redundancy and more effective capture of energy when they're partially shaded. In 2009 panels were generally around $2.00 to $2.50/W, and inverters around 50 to 65 cents/W. By the end of 2012, panels were widely available in wholesale at 65 to 70 cents, and string inverters around 30 to 35 cents/W. In comparison, micro-inverters have proven relatively immune to these same sorts of price declines, moving from about 65 cents/W to 50 to 55 once cabling is factored in. OpenDSS - - A comprehensive electrical power system simulation tool created by EPRI primarly for electric utility power distribution systems. It supports nearly all frequency domain (sinusoidal steady‐state) analyses commonly performed on electric utility power distribution systems. In addition, it supports many new types of analyses that are designed to meet future needs related to smart grid, grid modernization, and renewable energy research. The OpenDSS tool has been used since 1997 in support of various research and consulting projects requiring distribution system analysis. Many of the features found in the program were originally intended to support the analysis of distributed generation interconnected to utility distribution systems and that continues to be a common use. Other features support analysis of such things as energy efficiency in power delivery and harmonic current flow. The OpenDSS is designed to be indefinitely expandable so that it can be easily modified to meet future needs. Ramp-Up - If a slow enough ramp up is specified, there may not be a need for random reconnect timing. Most inverters can be designed to have soft start ramp up capability relatively easily. Ramp down capability - May be employed to coordinate with existing voltage regulation equipment and minimize adverse voltage impact. But ramp down may require some local storage. Rule 21- Electric Rule 21 is a tariff that describes the interconnection, operating and metering requirements for generation facilities to be connected to a utility’s distribution system, over which the California Public Utilities Commission (CPUC) has jurisdiction. The Rule 21 tariff for each of California’s large investor owned utilities (IOUs) is available on each IOU’s website. The CPUC's open interconnection proceeding is R.11-09-011. Sep 13, 2012: Rule 21 Settlement Approved - In Decision 12-09-018 the Commission approved the full set of reforms to Rule 21 proposed via a multi-party settlement. The Commission anticipates that the significant reforms achieved in Rule 21 will advance the Commission's goals of ensuring a timely, non-discriminatory, cost-effective, and transparent interconnection process for distributed generation in California. Var - Volt-Ampere Reactive power - Measures h out-of-phase voltage and current Unit used to measure reactive power in an AC electric power system. 1 var = 1 V•A. Vars measure unsynchronized "leading" or "lagging" currents. These currents are usually caused by the side effects of powering equipment that behaves like coils (e.g. motors) or capacitors (e.g. arc welders). VDE AR-N 4105 - German rules requiring its solar inverters to perform certain functions, such as power ramping and volt/VAR control, which lead to more stability that came into effect for medium-voltage connected solar in 2008 and for low-voltage solar as of January 2012. RPS target calls for increasing the amount of renewable electricity in California’s power mix to 33 percent by 2020. Achieving high penetrations of distribution connected PV will require the utilization of increasingly advanced inverters. Randomized Disconnect - Distributed generation resources are require them to disconnect at the first sign of trouble -- typically, when frequencies fall outside normal operating boundaries -- so they don’t feed dangerous and unexpected power back up downed or de-energized power lines. But that simple safety feature can actually backfire on the grid, by suddenly disconnecting whole neighborhoods of solar power during momentary grid power blips or faults, causing even more instability. In Germany, that problem was dealt with by randomizing the timing and specific frequency levels at which they tripped, as well as when they reconnected, to shift what would have been a concentrated impact to a more spread-out one. Low Voltage Ride-Through - Prevents inverters from tripping during voltage drops caused by momentary grid disruptions. Distribution Overvoltage - Too much solar power, and local grid voltage could rise, causing potential problems for motors, lights and other equipment. Local secondary overvoltage - Too little solar power and voltage can sag. That may only flicker light bulbs at home, but it can lead to million-dollar work stoppages for customers like semiconductor manufacturers and server farms that need clean power at a near-to-constant voltage and frequency. Technological Uncertainty - It’s a bit hard to quantify the costs and benefits of making all new solar inverters smarter, versus taking other approaches based on adding new grid equipment, because for the most part, the problem of too much solar is a hypothetical one. Manufacturing Cost - Smart Inverters could add about 10 percent to manufacturing costs to inverters, which make up roughly 5 percent to 10 percent of total solar system installation costs. However, adding a smart inverter at $150 per installation for each rooftop, for an inverter system with a typical cost of about $1,500 or more, is a smart investment. Retrofit Cost - A 2011 study by German utilities and energy agencies estimated that retrofitting the country’s installed solar base will cost €175 million ($234 million), and adding administrative costs could ring that cost up to $300 million. That’s a price tag that could be avoided in the United States, if regulators and the industry can get ahead of it. 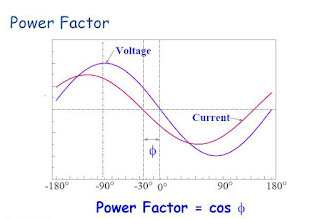 Reactive Power Costs - For example, a 150 kW solar facility with a 10 percent oversized inverter set at a 0.9 power factor can draw 15 kW of real power from the grid to convert to reactive power even when the solar facility is producing a full 150 kW of real power. While the costs of oversizing inverters are less than installing and maintaining capacitor banks, they are can still be significant for smaller generators. Therefore, generators should either be compensated for the costs of oversizing inverters or for the value of real power converted to reactive power, which can be easily accomplished by compensating based on KVA instead of KWh. Maintenance - Inverters are only warranted for 10 years, so chances are at least two inverters are required over the course of a 25-30 year panel lifetime. Compensation - If we want inverters to produce reactive instead of real power, capabilities for metering of ancilliary services must be developed. Communications - How can utilities coordinate thousands or millions of DER systems, located at customer sites and owned by non-utilities? How will functions and multiple autonomous devices work together? The US is not entirely analogous to Germany. Most of the US is much hotter than Germany, which means that in summer, consumption and generation are much better matched than in Germany. In most German homes, in summer basically there is only the fridge running. In the US, hello non-stop air conditioning. In the US, oversupply of solar will come much later than 40GW solar for 82 Million inhabitants. European experience with high penetrations of DER has shown that the implementation of some DER functions can costeffectively improve the reliability and efficiency of the power grid. Large secondary network - 400 V, 3 phase much bigger than typical US Distribution network. Phase 1 - Start with autonomous DER systems which provide volt/var management, low/high voltage ridethrough, responses to frequency anomalies, etc. Use interconnection agreements to ensure appropriate autonomous settings. Phase 3- Combine field and virtual modeling through power flow-based analysis, state estimation, contingency analysis, and other analysis applications to assess economics and reliability. Phase 4 - Ultimately integrate DER management with distribution automation, load management, and demand response for optimal power system management. PG & E - PG&E is seeing "some localized issues" with grid instability in neighborhoods where rooftop solar penetration has grown to around 5 percent, said Hal LaFlash, the utility's director of emerging clean technolog. 85,264 inverters <= 30 kW, total of 443 MW Recommend to grandfather the existing units <= 30 kW due to the relatively low system impact and high retrofit costs. The existing units > 30 kW may need retrofitting to include the ride through capabilities and to avoid inadvertent tripping during major system disturbances. SDG & E - has about 6,600 customers with solar rooftops. While that's growing by about 60 customers a month, it still only represents about 50 megawatts of generation, or about 1 percent of the utility's 5,000-megawatt total load. The utility can't monitor or control it, but there isn't enough of it to matter that much. Petra Solar - South Plainfield, NJ - Pole-mounted, solar panel-connected microinverter arrays Their microinverter provides reactive voltage injection capability, allowing the modules to balance the sometimes grid-destabilizing character of solar power. Power One (Symbol was PWER) - Camarillo, California - Recently purchased by multinational power sector giant ABB, ranks as the second largest international inverter manufacturer. Purchased venture-backed Fat Spaniel Technologies in 2010. SMA - The inverter market's international leader, recently made a big investment in Zeversolar, a major Chinese supplier. SunSpec Alliance- A trade alliance of solar photovoltaic industry participants, together pursuing information standards for the renewable energy industry. SunSpec standards address operational aspects of PV power plants on the smart grid—including residential, commercial, and utility-scale systems—thus reducing cost, promoting technology innovation, and accelerating industry growth. Energy Recommence - Provide hardware and software for consumers to monitor their systems. This workshop discussed the first phase of California's smart inverter implementation plan that recommends smart inverter capabilities that could be required to ensure the long-term safety, reliability, and efficiency of the power grid with high penetration distributed generation. Workshop discussions covered smart inverter functionality recommendations and a proposed testing and implementation plan for validating the recommended functions. 2012 California’s Transition to Local Renewable Energy: 12,000 Megawatts by 2020 (staff contribution). 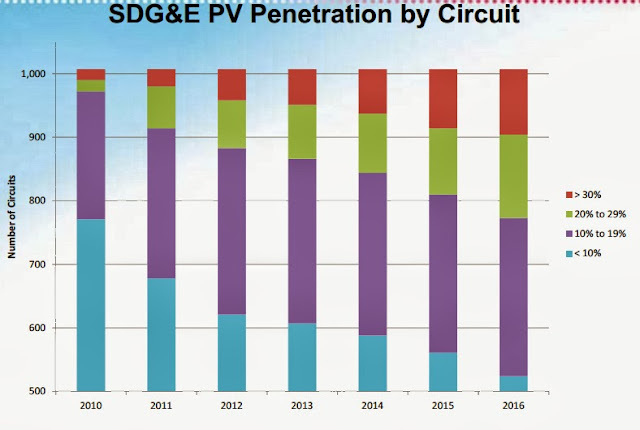 SunShot Initiative High Penetration Solar Portal - DOE EERE - High penetration solar research helps DOE understand, anticipate, and minimize grid operation impacts as more solar resources are added to the electric power system.